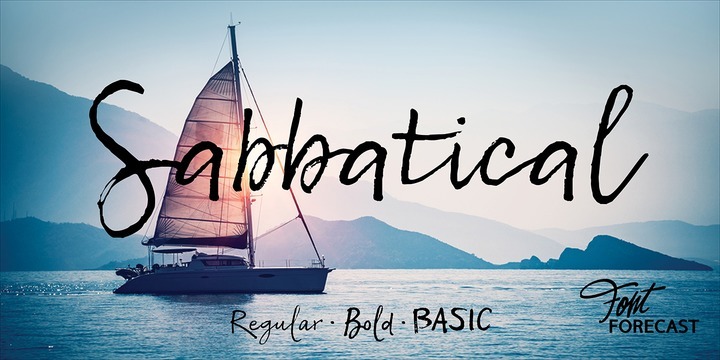 Sabbatical is a contemporary typeface created by Hanneke Classen and published by Fontforecast which is available in 3 handwritten fonts (Regular, Bold, Basic). It has more than 880 glyphs, Stylestic Alternates, Discretionary Ligatures, Stylistic alternates & Swashes. This brush script is ideal for display use, editorial purpose, greeting cards, logo, magazine, poster, wedding, web etc. Have fun! Price: starting from $17 for one font to $39 for all 3 fonts. A font description published on Wednesday, May 2nd, 2018 in Fontforecast, Fonts, Hanneke Classen by Alexandra that has 1,719 views.